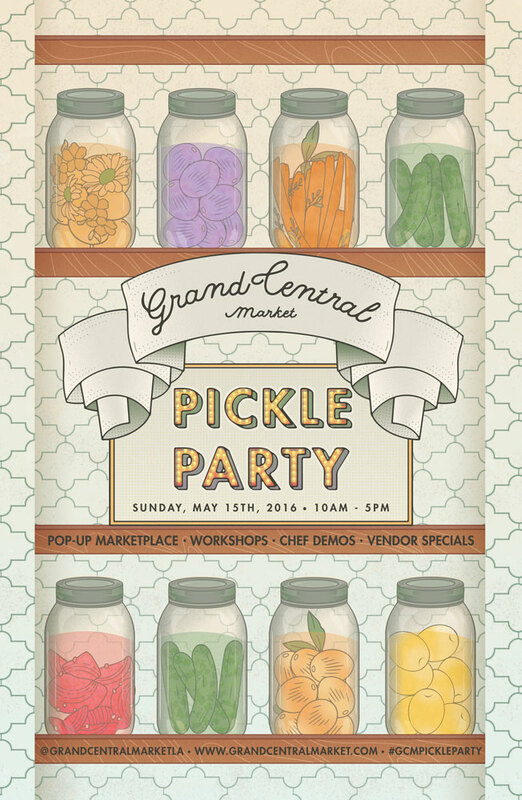 Grand Central Market | Events | Grand Central Market Pickle Party featuring Sandor Ellix Katz | Sunday, May 15th from 10am-5pm The first-ever Grand Central Market Pickle Party will be a one-day edible exploration of all things pickled, brined and fermented! The GCM Pickle Party will introduce visitors to the wide world of pickles and exp. The first-ever Grand Central Market Pickle Party will be a one-day edible exploration of all things pickled, brined and fermented! The GCM Pickle Party will introduce visitors to the wide world of pickles and explore the cultural diversity of pickling traditions from around the globe. Market vendors will create onetime #flashsale menu items based on pickled ingredients, and visitors will learn to pickle at chef demonstrations while also rolling up their sleeves to make sauerkraut alongside the country’s premiere fermentor. Pickle Party’s centerpiece will be 1,000 POUNDS OF KRAUT, a crowd-sourced communal sauerkraut-making session led by fermentation guru Sandor Ellix Katz, the New York Times best-selling author of The Art of Fermentation. The public is invited to join the day-long KRAUT MOB, and we’ll keep making kraut in our pop-up KRAUT LAB until we reach our goal of 1,000 pounds. Thanks to generous support from GCM produce vendor District Market, each participant will go home with a free jar of sauerkraut and printed instructions for how to finish fermenting their live kraut at home. In addition to being a renowned teacher—or, as he calls himself, a “fermentation revivalist”— Katz is also an impassioned speaker, and we’re pleased to announce that he’ll give a free public lecture on his fundamental theme of fermentation and culture. Later, he’ll be joined by Pascal Baudar, a professional forager and author of The New Wildcrafted Cuisine: Exploring the Exotic Gastronomy of Local Terroir, for a wild-foraged pickle demonstration. A book signing by both authors will follow. Sandor Ellix Katz is a fermentation revivalist and the author of Wild Fermentation and The Art of Fermentation, which received a James Beard Foundation Book Award in 2013 and is widely acknowledged as the new fermenter’s bible. The New York Times called Katz “one of the unlikely rock stars of the American food scene,” and he was honored by the Southern Foodways Alliance with its Craig Claiborne Lifetime Achievement Award in 2014.